From www.iaaf.org – Berlin, Germany – With a performance that defies the imagination, Usain Bolt set a new 100m World record of 9.58 on the second evening of the 12th IAAF World Championships in Athletics at the Olympic Stadium in Berlin. His was the largest chunk ever – by far – to be sliced from the 100m World record. 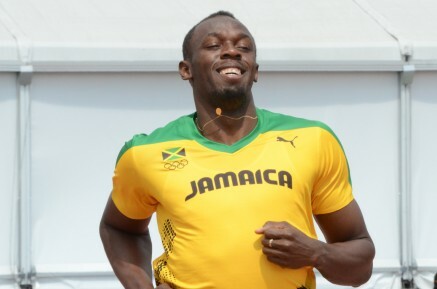 Previously, both he and Maurice Greene shaved 0.05 from the standard to earn the moniker of World’s Fastest Man. A few days ago, Greene suggested that Bolt and other top sprinters weren’t currently on the same planet. Bolt’s performance this evening gave Greene’s assessment an otherworldly ring of truth. So profound was Bolt’s achievement that defending champion Tyson Gay clocked a sensational 9.71 in second, a national record, that was just 0.02 shy of the previous World mark. And the American, who is now the second fastest man in history, was nowhere near the Jamaican when the finish line was crossed. “I’m disappointed to have lost the race, but i ran my fastest time,” Gay said. Not the quickest from the blocks, Bolt nonetheless took control some 30 metres into the race and continued onward to forge through territory not even the most passionate observers would have imagined before this evening. It was a run similar to his emphatic victory in Beijing’s Bird’s Nest stadium a year ago, with two distinct differences: this time Bolt ran hard to the line, and this time he’ll collect a $100,000 World record bonus. Further back was the second wave, led by Antiguan Dan Bailey who was fourth in 9.93, just ahead of Olympic silver medallist Richard Thompson of Trinidad who was credited with the same time. Dwain Chambers of Great Britain was sixth in 10.00, edging the second Trinidadian in the race, Marc Burns, who also stopped the clock in 10.00. In the other events Christine Ohuruogu’s title defence is firmly on track as she looking good in 400m qualifying. Nicola Sanders (GBR) was unfortunate to finish 9th overall and miss the final by one place despite running a season’s best 50.45 secs. Philips Idowu (GBR) secured his qualification for Tuesday’s final with a 2nd round effort of 17.32m, well beyond the automatic qualifying mark of 17.15m.